As long as you can look for two anchor points, such as posts or trees, a hammock helps you sleep or relax almost anywhere. However, first thing you should do is to attach your hammock to the said anchor points in order for you to use it. This means that you have to get the suitable angle and tie a knot. These processes aren’t hard. But, there are several tips to help you lead to a much cozier sleep. Here are some of them. If you not yet own a hammock, or want to explore your options, the website Royalhammockheadquarters is a fantastic source to get tips on the different types and styles out there! To start with, you must consider how to tie a hammock is connected to the straps. This means that, before you can secure your hammock to the anchor points, you have to secure your straps onto your hammock. However, this isn’t always the situation. Oftentimes, the straps and the hammock are built as one. This means that you don’t have to separately attach them. Most of the time, you will have to manually tie the straps to your hammock. To do this, you have to select a knot that will connect without any risk of falling off. You must also choose a knot that will allow you to easily untie it after using. Take the rope’s end and grab it a bit way down. You need to ensure that there is enough at the end for the next step. Using the remaining end of the rope, create a big loop. Then, grip it in the same hand to create a noose. Youcanthinkof it as a head. Next, take the rope’s end and wrap it around the base twice. You can think of it as if you are strangling the head. Then, insert the remaining end over the loop. Think of it as if you are stabbing the head in its eye. Now, you’ve got your figure 8 knot. This knot should be durable enough not to fall off. On the other hand, you can easily untie this type of know whenever you have to. The next thing you should do is look for your anchor points. The most common anchor points used are trees. Ideally, there should be 13 up to 16 feet distance between the two trees. However, you can extend the hammock straps using a length of the rope if the distance is too far. When measuring the distance between the two anchor points, one thing to consider is how to tie a hammock hangs. Your hammock will look stretched and straight across the gap if the distance between the two anchor points is too far. That would considerably lower the maximum load. It will also make your hammock less cozy. Whenever you test the distance, the hammock should resemble like a banana. This means that there should be a little dip (shown here). On the other hand, the attachment must come away from the anchor points at around 30 degrees. This will offer the most durability. It is really helpful if you have a tool that can measure the height of your attachments. However, you should be okay as long as the attachments are approximately the same height. Furthermore, the thickness of the anchor points is also a vital thing to consider. 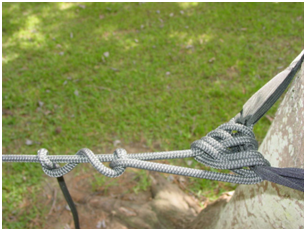 However, almost all hammock tree straps nowadays come with extra material to ensure you could fit easily around a wide anchor point. Once you familiarized the art of tying a hammock, you can turn any anchor points into an ideal place to hang your hammocks!